Happy Valentine’s Day! We are drying out down here in South Alabama. It rained for 40 days over 3 days here, Sunday through yesterday. Like SOLID RAIN. It was pretty miserable! We have an empty lot next door to us which has some major drainage issues. 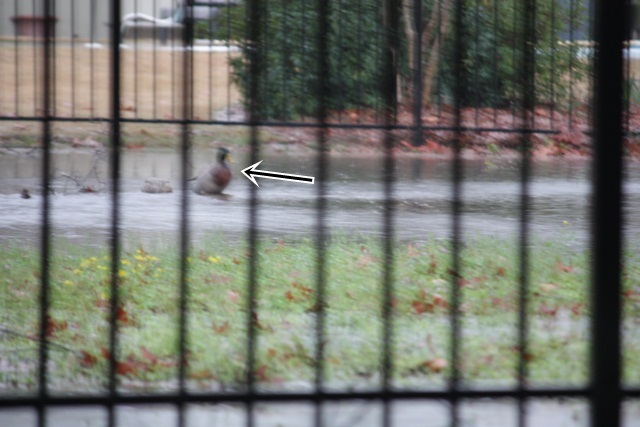 Factor in 3 days of rain and we were tickled to have ducks swimming around as if it were a real pond or lake. The sun finally came out today and we’re getting our sanity back!! Last week I monogrammed 6 bath towels, 3 hand towels and also 4 wash cloths. 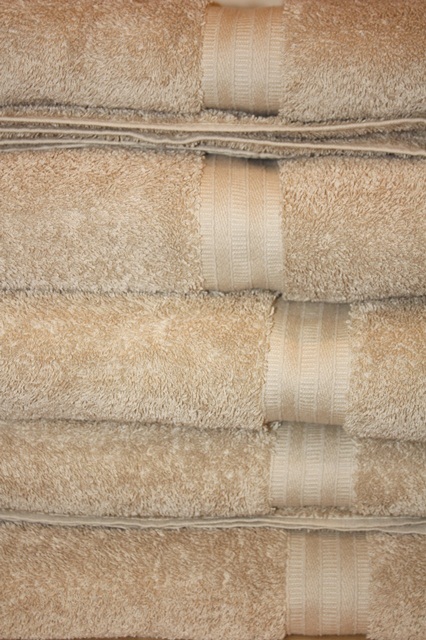 The bath towels took 48 minutes each to sew! I used Monogram Wizard Plus “Candlewick” font in FILL STITCH. They turned out great, and I am envious of the new towels (that belong to my customer)!! 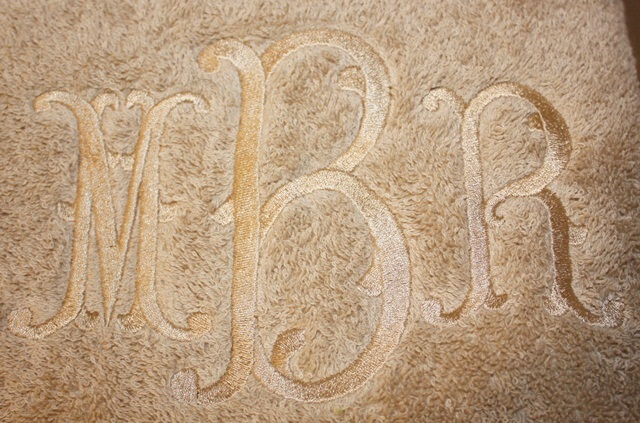 More info on the monogram ~ the size of the entire monogram was 4.79″ tall X 6.96″ wide. Stitch count was 27,617 stitches and I think I had my machine set on 800 stitches per minute = 48 minutes! The hand towels and wash cloths were a breeze and pretty fast. She chose a tone on tone color scheme! It looks great and very elegant!! For towels I use iron on tearaway on the back + solvy water soluble on top. Hoop it all! The tearaway and solvy then peel right off when I’m done. Now for my “repurpose” part of the post, which is a very popular term used these days for furniture and such. Not sure if it applies to clothes, but it sounds good for the purpose of this post. We have a few consignment sales here in town before spring/summer and fall/winter. I went last week and found this cute dress for like $12. I have found cheaper dresses w/ monograms but this was super cute for summer and I could tell by looking at it I could whip it in to shape. 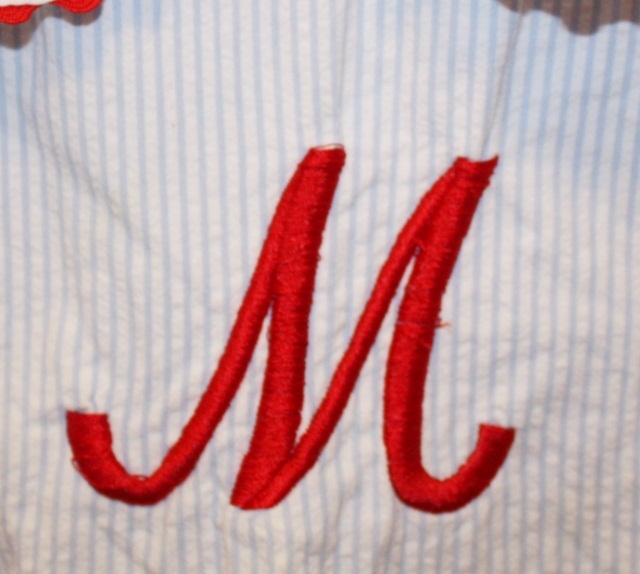 Yes, my daughter’s name is Mallory, so the M would work. But…. this was a pretty bad monogram job. No offense if the monogrammer person is reading this. I don’t think any stabilizer was used, and it was picked and just didn’t look good! 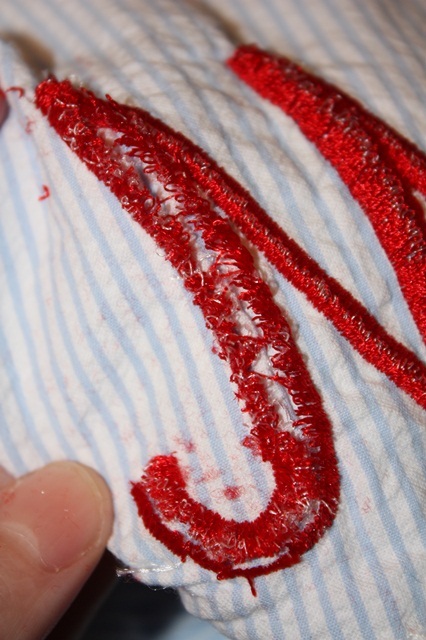 The fabric was gathered and some of the thread was coming loose. Not good. 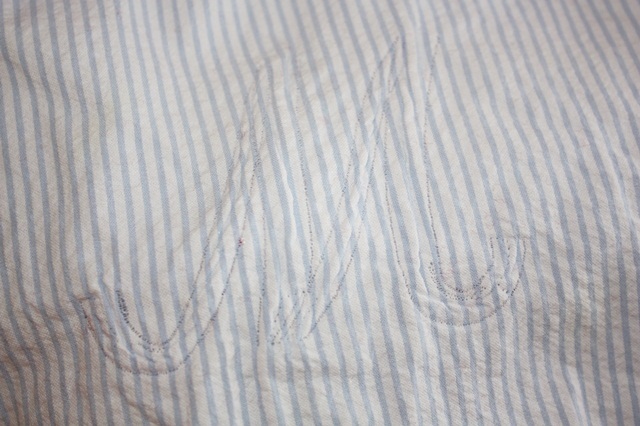 Looking on the back side of the monogram, it was loose and I knew it would be super easy to remove! 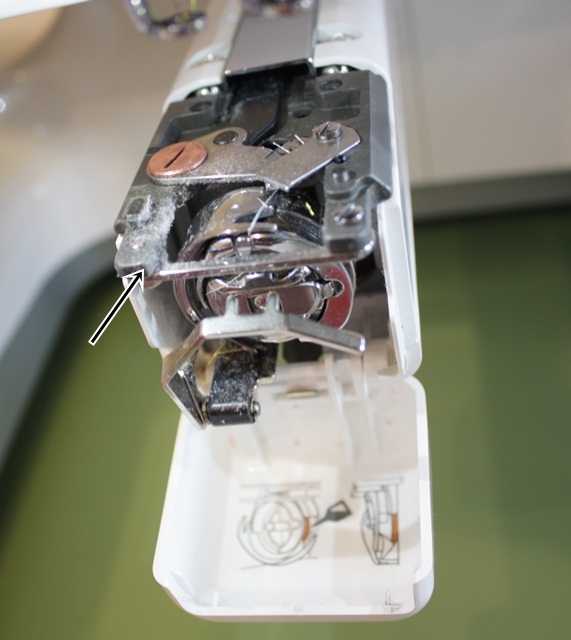 Very little bobbin thread showing = again… not good. I was able to remove all of the monogram with my regular little scissors that came w/ my machine. That’s how loose the stitching was! I cut through the entire “M” and then removed all the thread. 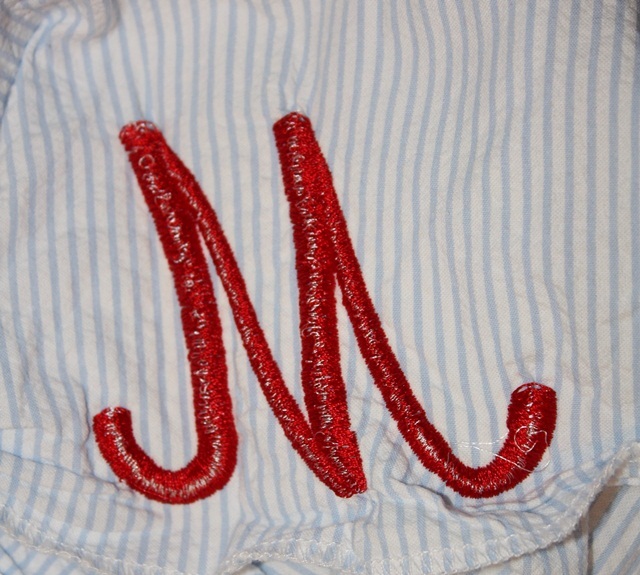 As you can see the fabric is gathered underneath the monogram. I found no trace of any stabilizer. This was an easy one to remove! After I got it all removed, you could see the little holes from the previous “M”. Not a problem! I find that a little water and ironing will do wonders! 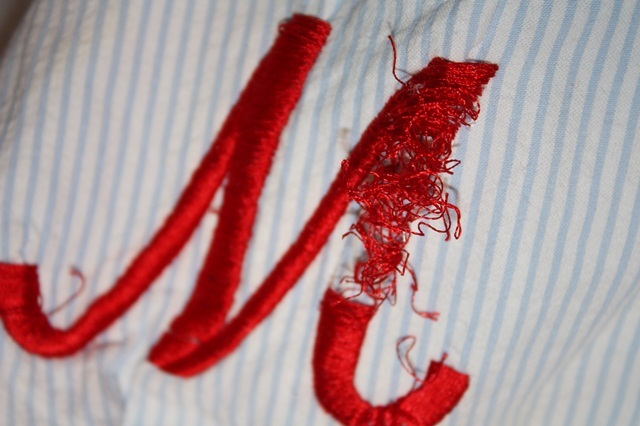 Looks much better below, and I think once the dress is washed you will barely see any remains of the monogram. 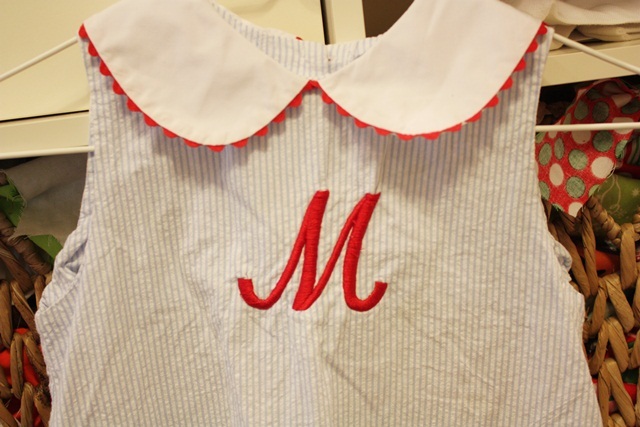 Today I finally got a chance to re-monogram the dress and it looks precious! I used Monogram Wizard Plus “Pendant” font, and added a couple of dots on each side (layered in MWP – SySerif SyS 26, size .75 – layer 2 and 3). I also made the M wider in MWP (Letter Width 125 I believe — default is 100). This will be a cute $12 dress for summer! As you can see below, you can barely see any remnants of the previous M! I really really really like this “M” font. As I said, I monogrammed 13 towel items in the past week. Today I knew it was time to CLEAN my bobbin area. It was full of lint. See my last post on PR650 maintenance. I dusted it all out using my brush and also Qtips and alcohol (not the drinking kind). I also cleaned the bobbin case and changed my right 3 needles which are used the most. I normally change all 6, but just changed them recently so I only changed the right 3. While I was in a cleaning mood, I decided it was time to “clean” my thread stand and thread and organize all my thread by color. 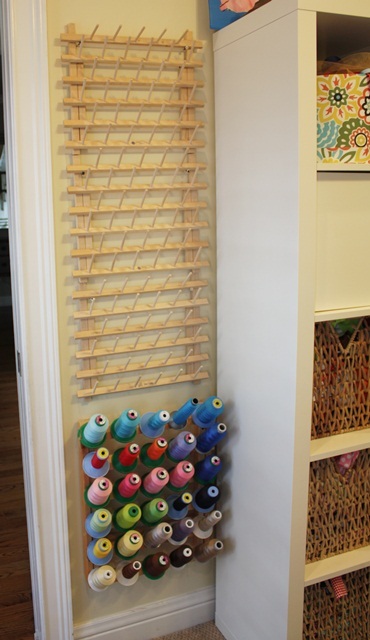 I took all of my spools off and used a towel to wipe my stands, which are hung on the wall. I have 3 June Tailor stands and then 1 big 5000M stand I got from www.sewingmachine.com. They get dusty! I also wiped my thread spools off with just a dry towel to knock any dust off. Isn’t it pretty?? Wow I have lots of greens!! I organized my big spools last night. 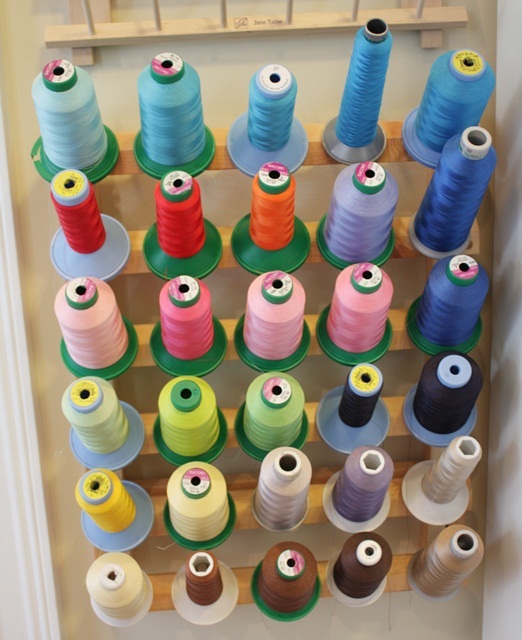 I mostly use Isacord and Exquisite thread, but have a few other random spools as well! 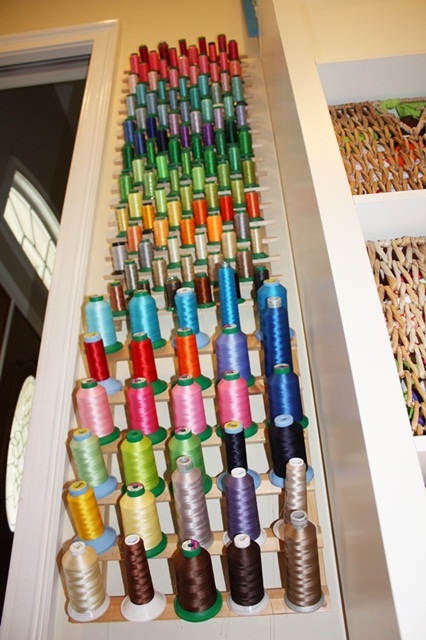 In my Expedit cubby I have a whole cubby devoted to random thread organized thrown in there. These are extra colors or colors I rarely used. Some variegated in there too I’ve never used. 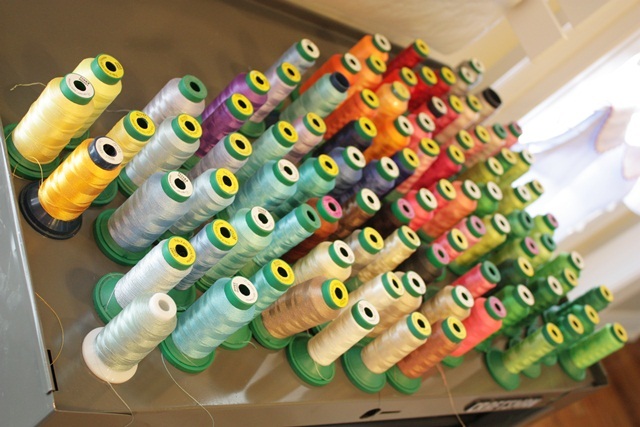 I have waaaaayyyy….. too much thread. But, I honestly use most of it! Especially all the pinks and greens! Hope you all have a great VALENTINE’S night! Great post!! Thanks for the inspiration! LOVE! the pendant monogram! 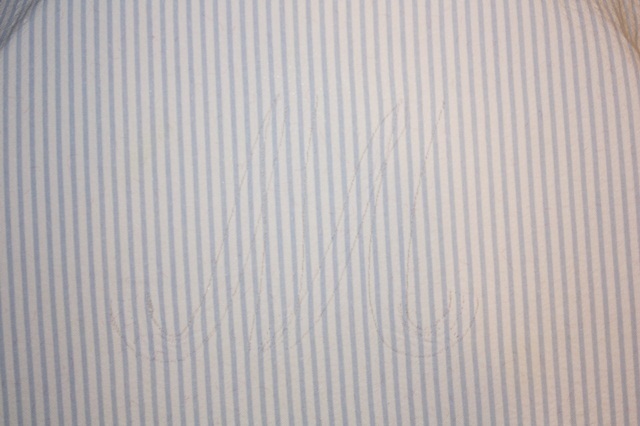 Since your first post I have been using the “dots” on lots of monograms….everyone loves them! Keep the ideas coming…they are always good ones. Oh…..made it to TJs on Monday on my way to the beach…..what a fun place and TJ was so helpful and friendly….posted a picture of us on FB. My heart raced the whole time I was in there! LOL…so thanks for sharing such a fun place and precious lady with all of us! 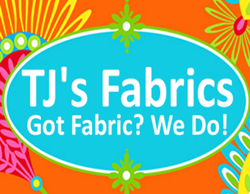 I’m so glad you made it by TJs!! 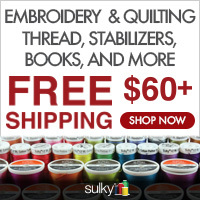 I just love your blog and store!!! 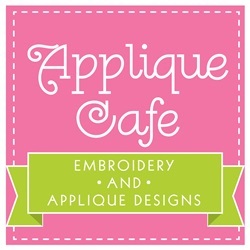 Whenever I need a design your store is the first place I go!! Thank You for the inspiration to clean my sewing room!! Can’t wait to get started. I love this!!! 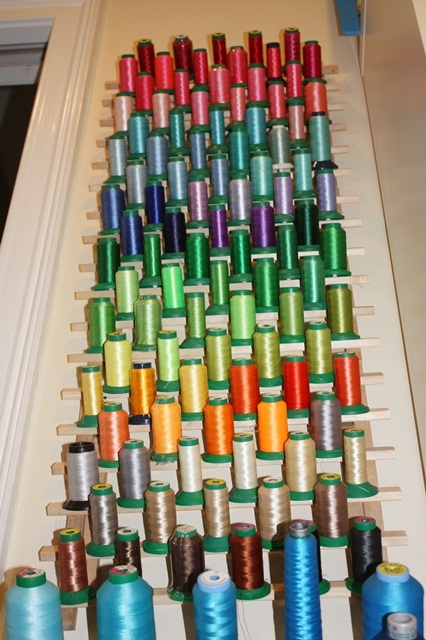 What neat ways to organize the thread? 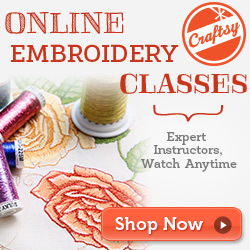 What kind of embroidery machine do you have? I’d love to have one myself. I recently purchased an entry level embroidery/sewing combo and I quickly learned that the 4×4 hoop wasnt big enough for the appliques I was wanting to do. My question is , is a 5×7 hoop large enough for most toddler/youth applique shirts? The 4×4 applique just looks tiny on my toddler’s shirt! I can upgrade my machine in the first 90 days, and I am hoping the 5×7 is big enough, but I am not sure! Thanks for your input!! I used a 5×7 for 2-3 years and it was fine!! The only time I use a larger hoop is when I’m doing a 5×7 design which might fill the hoop, plus a name. My machine allows me to use a 9×9 hoop which is nice. I NEVER use a 6×10 design on anything. I think 5×7 is pretty big. The only thing is that w/ some designs you might need to hoop again to add a name. Hi! I just love the Pendant font you used on your daughter’s dress. Do the dots come with it or did you add them? I added the dots in MWP – using the Motif feature and layered the initial, then dot, dot. I put which motif in the post! Basically added a period! I LOVE the ‘new’ M with dots. Very pretty! I meant to ask, is it fairly easy to attach the thread organizer to the wall? Also, what stand do u use for your embroidery machine? I love reading your blog and browsing your website. The racks are attached by a long screw – just sitting on the screws. My stand is a piece of furniture from homedecorators.com – it’s a file drawer cabinet thing. I’ve also used a Craftsman Tool Chest. There are pics on my blog! 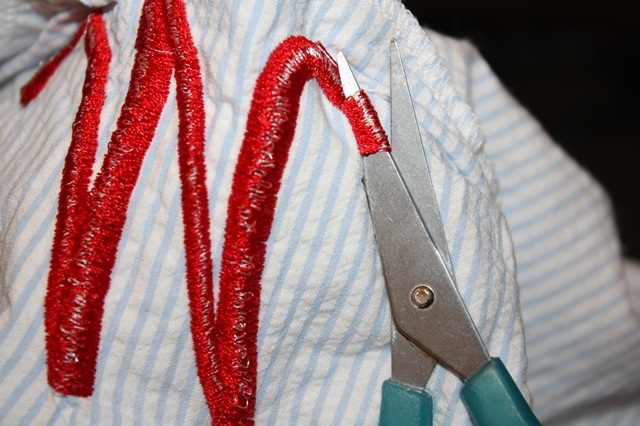 If you scroll down to Tags on the right side of my blog, there is a tag for Sewing Room with photos!! Great post! Your font choice and dot embellishments totally made that dress pop! Looks terriffic! Thanks for your great posts. LOVE the dress you chose and the monogram! 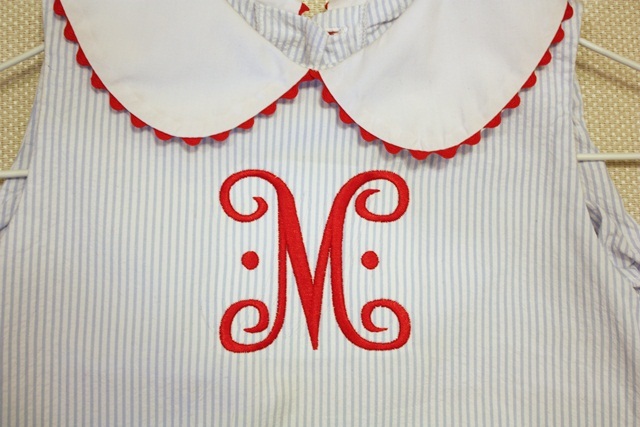 It looks like the kind I dressed my daughter in…wish I was monogramming back then! 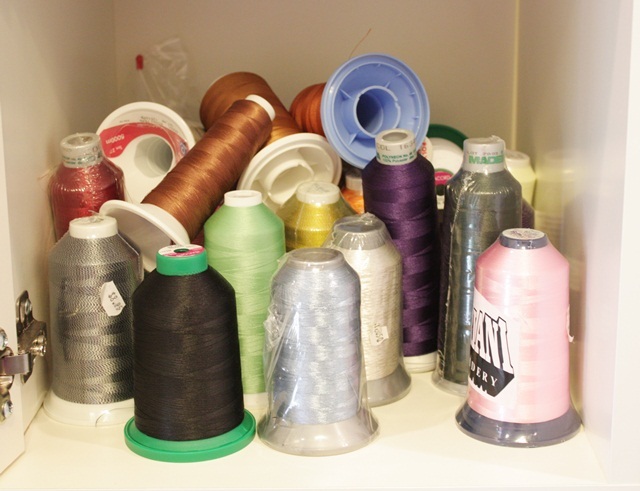 I also store my thread the same way you do for both sewing and embroidering. I have odd wall space, so I ended up stacking my June Tailors, as well. I find it works quite well ;0) Btw, adore your designs! It’s neat to meet someone from Alabama! I saw some cute things at a consignment sale last week but didn’t think about taking the monogramming off and redoing it. I got an embroidery machine (Brother SE400) for Christmas and I’m just now getting to really use the embroidery side of it. I’d do much better if I could get the shirt or onsie lined up in the hoop easier. I noticed on my last project mine didn’t show much bobbin thread on the back either. How do I fix that? Adjust the tension? I am using up my scrap fabric practicing with my machine. HI- Love the towels! I’m just curious on jobs like this that take a lo g time on the machine….how do you charge?? I always struggle with this! I usually charge a couple of bucks more than I normally would for a regular monogram. 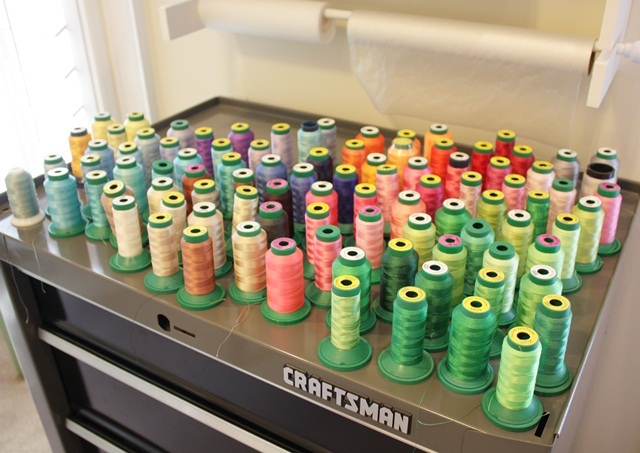 A hint I read is to buy the white stickers that repair the holes on notebook paper…write the color number off your thread spool and then put the sticker over the pegs on the spool rack, then you will know what color of thread goes back on a certain peg. Helps to keep your thread organized. I bought it at Sewingmachine.com at their West Point location. Not sure if they sell it online? You might call and ask them.